Pitching Machine Pro believes in providing the best services and equipment available to its customers. Our customers are happy to buy Jugs pitching machines, conscious of the fact that the brand is well known for the quality of its products. Jugs Pitching Machines are designed to help develop muscle memory, hand-eye coordination, and transform mediocre players into MVPs. At some point, most children dream about becoming famous, professional athletes. Nudge their dreams towards reality by giving them the equipment that will help them develop skills that will be noticed by scouts for professional baseball teams. 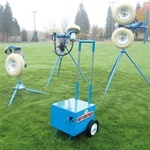 Jugs Pitching Machines, such as the Jugs Curveball Fastball Pitching Machine, are among the most popular and widely used pitching machines in the world. Jugs Pitching Machines have been credited with radical improvements to the practice procedures in baseball. The Jugs Curveball pitching machine has a patented gooseneck design that allows it to throw any type of pitch: left- or right-handed curves, sliders, straight or rising fastballs, and even sinking "split-finger" fastballs. Skills will improve dramatically with regular batting and fielding practice sessions. The machines are designed to allow the most visible motion of the throwing arm so that proper timing can be established and the most game-like scenarios possible can be achieved. Jugs pitching machines are also available for junior players and softball players. The Jugs Jr. Baseball Pitching Machine is world renowned for its new digital readout display. Coaches and parents can decide precisely how many mph their players should be hitting. Speeds range from 20-52mph. This Jugs pitching machine throws baseballs, Sting-Free baseballs, tennis balls, Lite-Flite-balls, the new Jugs Pearl, New Softie baseball, New Softie small balls, and the new Jugs BULLDOG. Portable at 56lbs, the machine throws fastballs, pop-ups, and fly balls for players aged 6-12. Other players in the Jugs Pitching Machines line-up include the Jugs Baseball Practice Deluxe Package, with everything your team needs to get the most out of hitting practice. The large instant screen (7' X 8') will catch all of your hits, is ideal for drills, and acts as a pitcher's trainer or portable backstop. Light and easy to transport, the 14lb screen does not require assembly, and fits easily into the coach's trunk. The hitting tee is adjustable to anyone's height, and the 24 sting-free balls make sure that you focus on hitting practice, not chasing balls. Accessories are available to purchase with your Jugs Pitching Machines; items such as the Jugs Radar Gun or protective screens can enhance your team's or your backyard diamond. Nothing can replace the time spent with a real pitcher or game-like practice scenarios, but Jugs Pitching Machines are the next best thing to having a pitcher on-call twenty-four hours for your team or for yourself. Check out our information for your best-fit scenario. Pitching Machine Pro is a company run by professional baseball players who know the quality that Jugs pitching machines will bring to a home or a team. Check out our selection of Jugs pitching machines today.